Bored with playing with your friends on Angry Birds Friends, the Publisher of the game, Rovio has lived up to the task by serving a fresh new update to its Angry Birds Seasons franchise, taking it to v3.3.0. 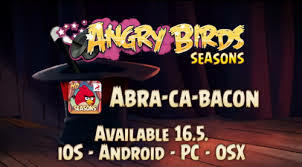 And as per the company reports, the update is based on magic, hence the name Abra-ca-bacon. Rovio's new Stockholm studio is behind this update. The update comprises of 30 new levels and has magic in it. You can also unlock 6 additional bonus levels. And finally there is Magic Portal, a new gamplay that Rovio has introduced with this game. It allows players to teleport just about anything from one portal to another, including the birds and pigs. iOS users can get the update here at the iTunes store. If you wish to enter the old world of gaming, play the Pac Man here or visit here to download Temple Run. And if you want to share your scores with your friends visit Angry Birds Friends.